In January 2016 Kali Marnane joined the Australian NGO The Anganwadi Project to design and build a new preschool in the largest slum area in Ahmedabad, India. Here she reflects on what life is like for those who attend and work at the preschool. It’s 9.30am and parents begin to arrive with their children at the preschool in the slum area called Ramapir No Tekro slum in Ahmedabad, the largest city in Gujurat, western India. The preschool is typical of many in the area; it is a cramped, corrugated iron shed with insufficient light and ventilation. In a city that can reach 50 degrees Celsius in summer, learning can be impossible for the children. The preschool teacher records infant’s weight in government issued ledgers while the preschool assistant prepares the first meal of the day. By 10.30am most of the children have assembled for their morning prayer and sit together in a circle on the floor to eat. Children in India suffer from one of the highest malnutrition rates in the world and the government supported preschools often provide the only food a child will eat in a day. After their meal the children play games, sing songs and learn to count, repeat the alphabet and identify colours and animals in both English and Gujurati. A tiger is the children’s favourite animal in our preschool, named Bholu 15. This preschool is the fifteenth to be built by The Anganwadi Project in partnership with a local NGO Manav Sadhna, who are dedicated to uplifting the poor. The preschool children are sent home at 2.30pm after their lunch and the assistant teacher cleans up the classroom. The preschool teacher then attends to home visits where she educates parents on hygiene, the importance of education, nutrition and family planning. The last 60 years have seen a vast migration from rural areas to cities in India with urban centres growing at exponential rates. Migrants are leaving their villages for many reasons including the irregularity of rain, unemployment, overpopulation and the appeal of city life. 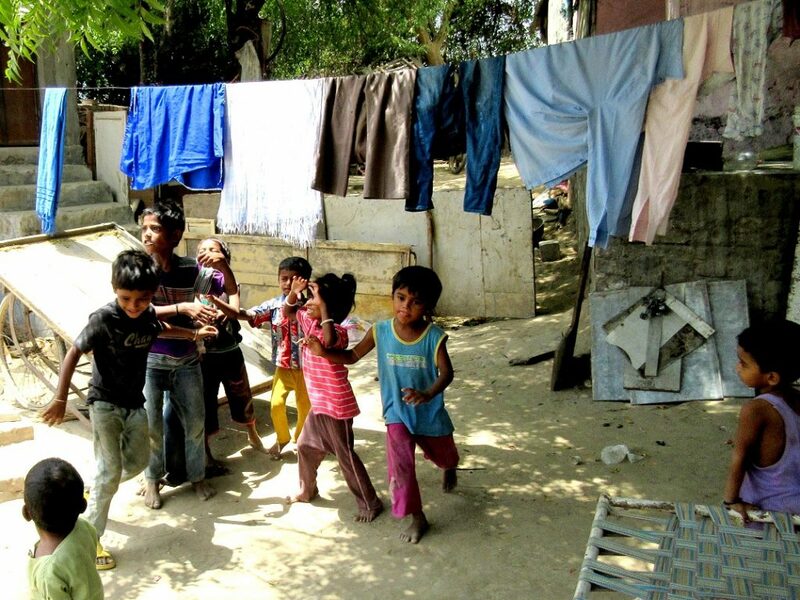 According to UN-Habitat, 40 per cent of the population of Ahmedabad lives in slum accommodation. As a foreigner observing the slum it is too easy to romanticise the lively street life and ingenious creations of the local people or write them off as filthy places that need to be removed. But on any given day in Ramapir No Tekro you will find working families trying to survive, parents getting their kids ready for school and preschool teachers doing their best to educate their class. With an average of 33 per cent of the urban population of developing countries living in slums, what is normal? How should we define “normal” housing and development?